Visiting with the ladies of Hanover Chapter 1399 of the U.D.C. on April 18, 2019. I told stories of our ancestors from the letters I collected in I Got Nuthin Strange to Rite. It is always a pleasure to spend time with my friends in Chapter 1399. 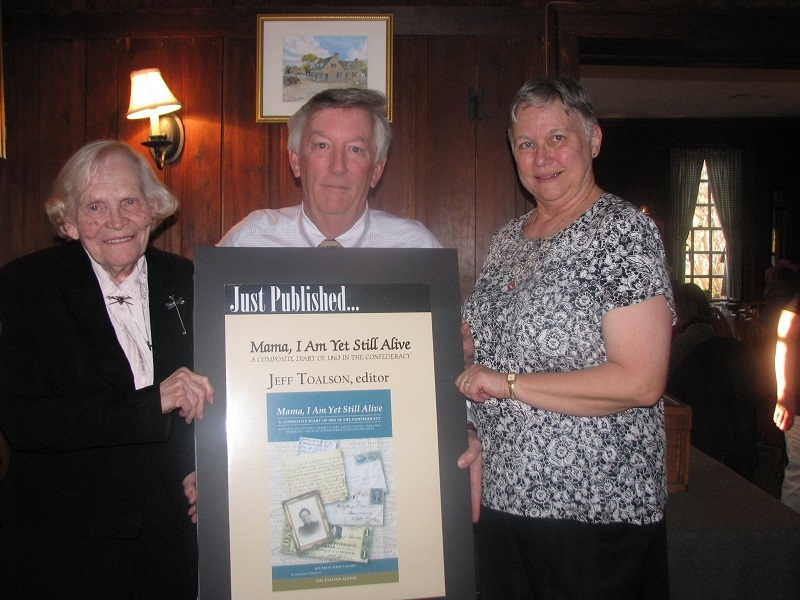 On May 15, 2015, I was in Warrenton, Virginia, with the Black Horse Chapter of the U.D.C. Richard Watkins visited with the ladies and told stories. I have probably had ‘Richard’ along with me for over 100 talks and was honored when this flask arrived about two weeks after my talk. Without a doubt this is the most thoughtful thank you gift I have ever received. The Black Horse ladies made a special effort to create this thank you and I am deeply touched. This is the battle flag of Hood’s Texas Brigade. I was a guest on April 1, 2015, with the Edmund Ruffin Fireeaters SCV Camp in Mechanicsville, Virginia. I told stories from the letters in ‘Mama, I Am Yet Still Alive’ and accompanied the stories with various artifacts. 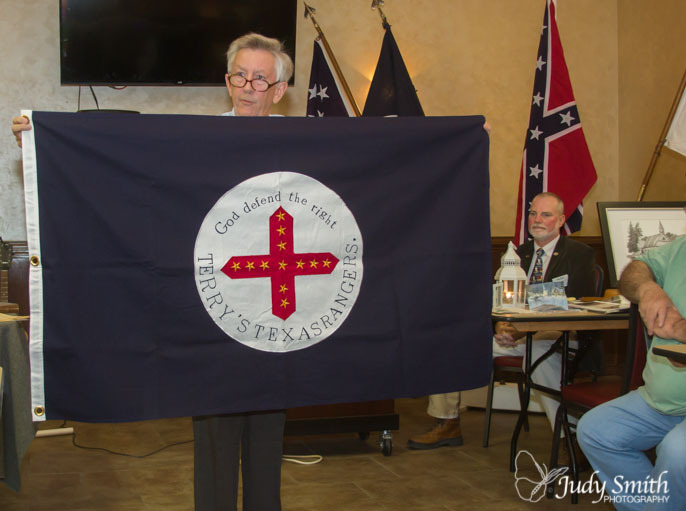 Terry’s Texas Rangers carried one of the most beautiful battle flags of any Confederate military unit. they served in the Army of Tennessee and surrendered with Gen. Joe Johnston’s army at Durham and Greensboro in late April, 1865. It was a wonderful evening laughing and sharing stories of our ancestors with the Edmund Ruffin Camp. 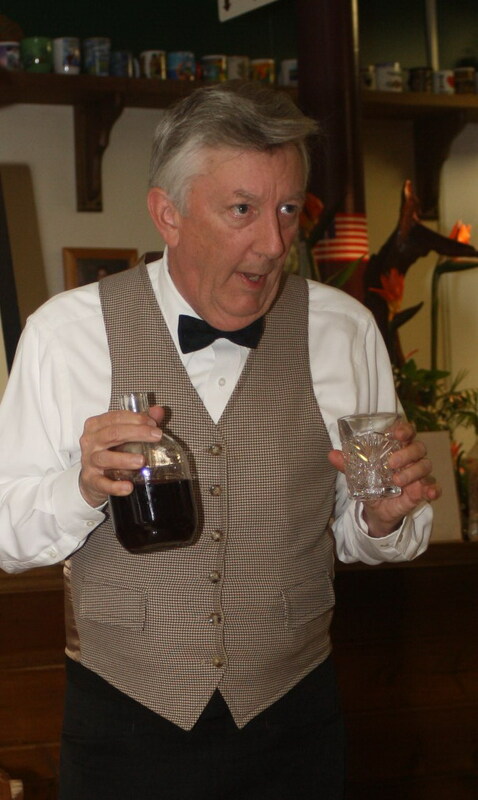 Richard Watkins is getting all excited about pouring a glass of Sister Lavalette’s blackberry bounce. 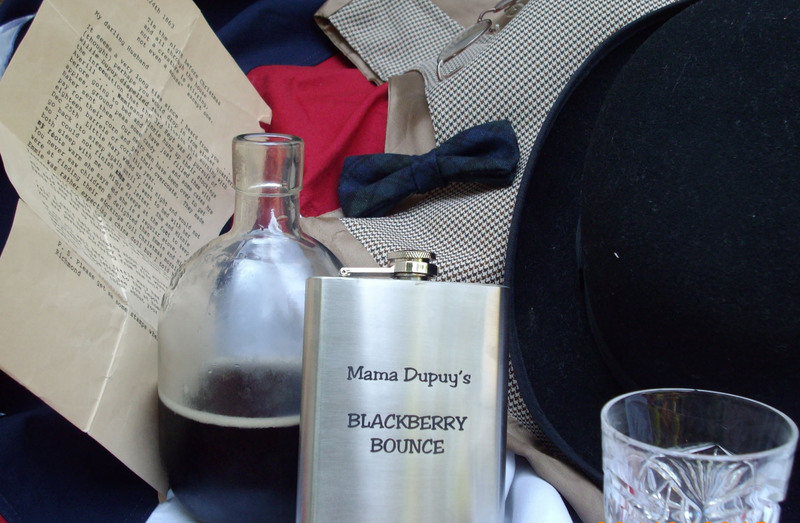 He is convinced that Lavalette uses 50% blackberry wine and 50% brandy to create her bounce. No wonder it is sooooooo good. 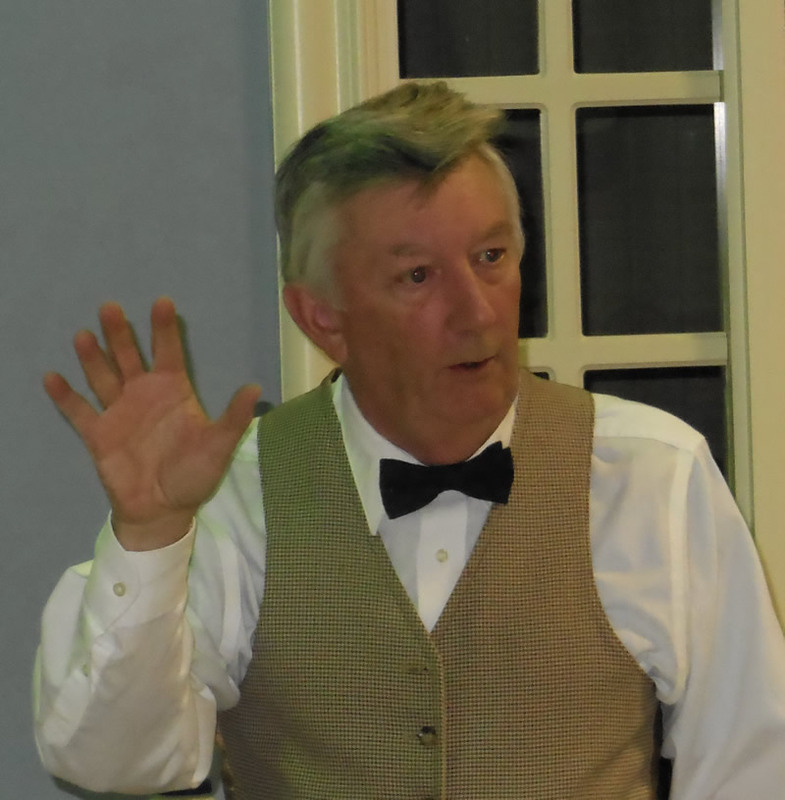 At a talk with the William Latane SCV Camp in Mechanicsville on January 14, 2014. At a ‘Mama’ book talk with the Charlotte County Grays SCV Camp. 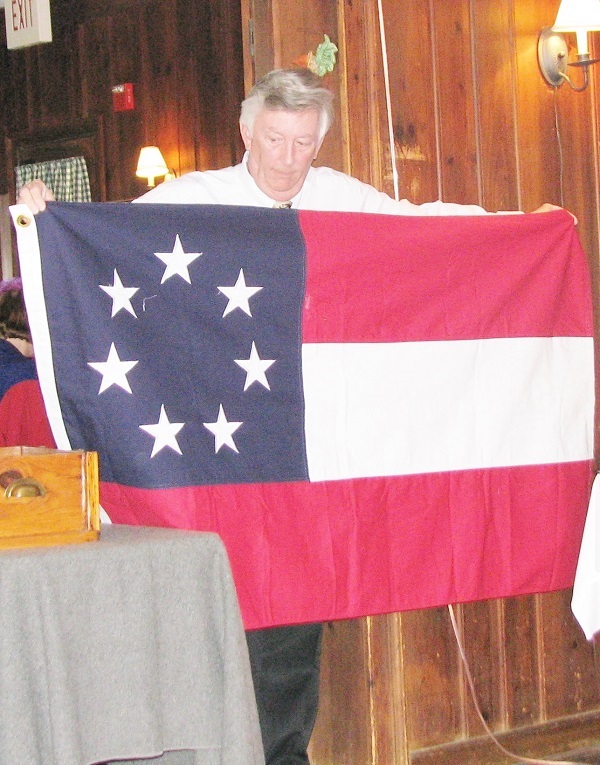 This is the command flag of the Army of the Trans-Mississippi under General Edmund Kirby Smith. 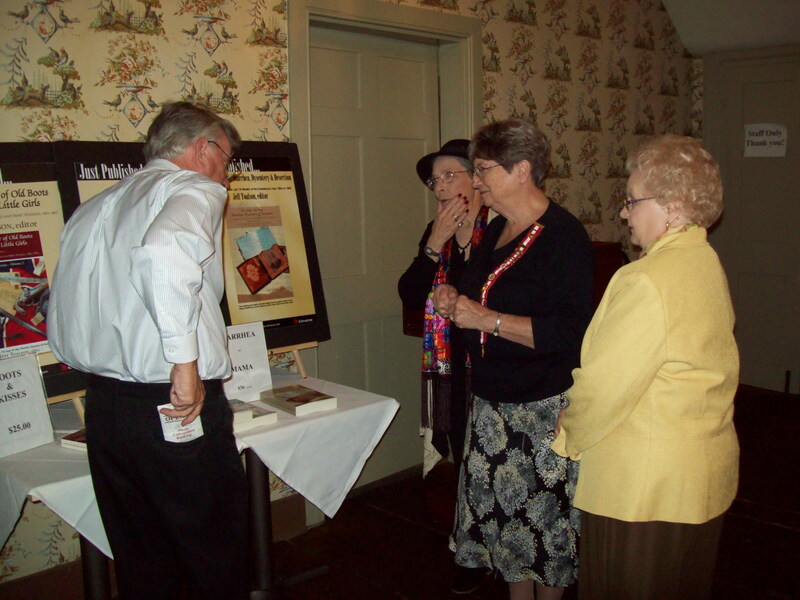 Jeff at the Hanover Tavern visiting with ladies of the Centennial Maury UDC Chapter after a ‘Mama’ book talk. 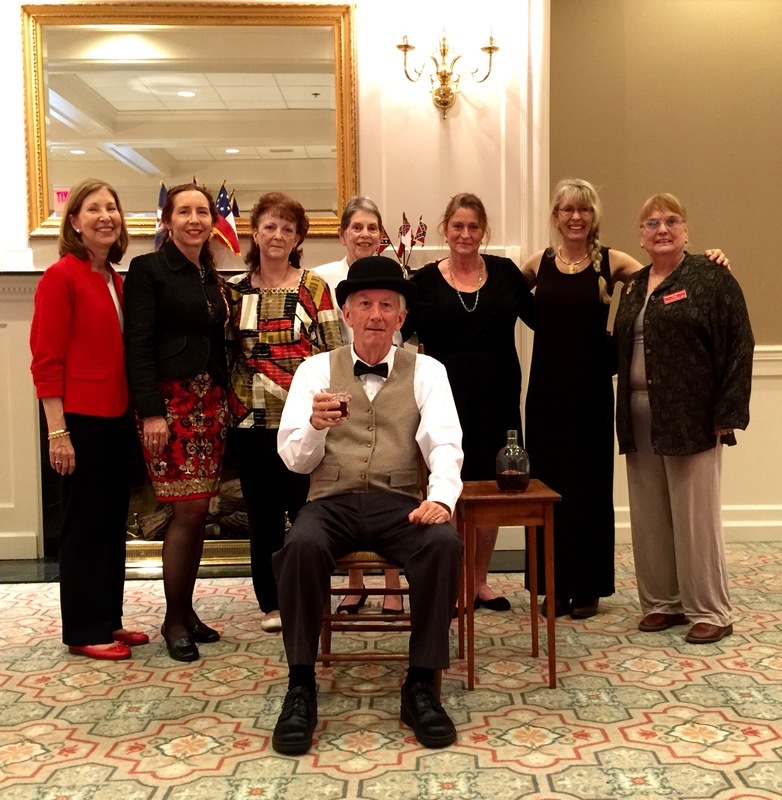 Carrot Tree Tea Society – Yorktown, Virginia. 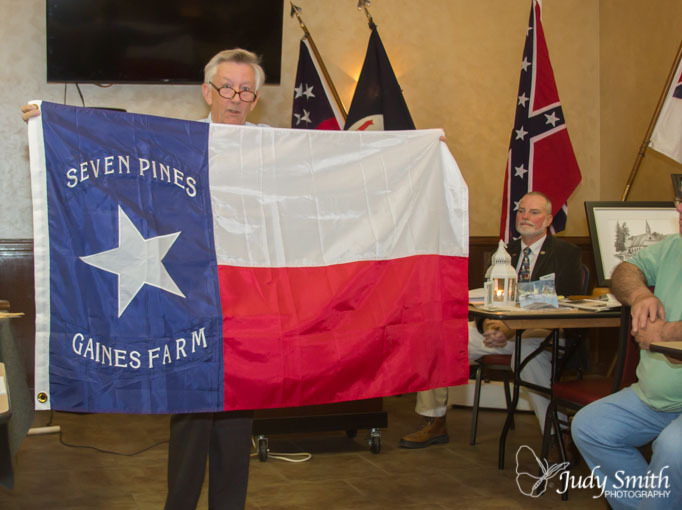 I am displaying the original 7 star ‘First National Flag.’ Only the cotton states have seceded and they have not been joined by the additional states that will secede when Lincoln calls for troops to invade their 7 sister states. 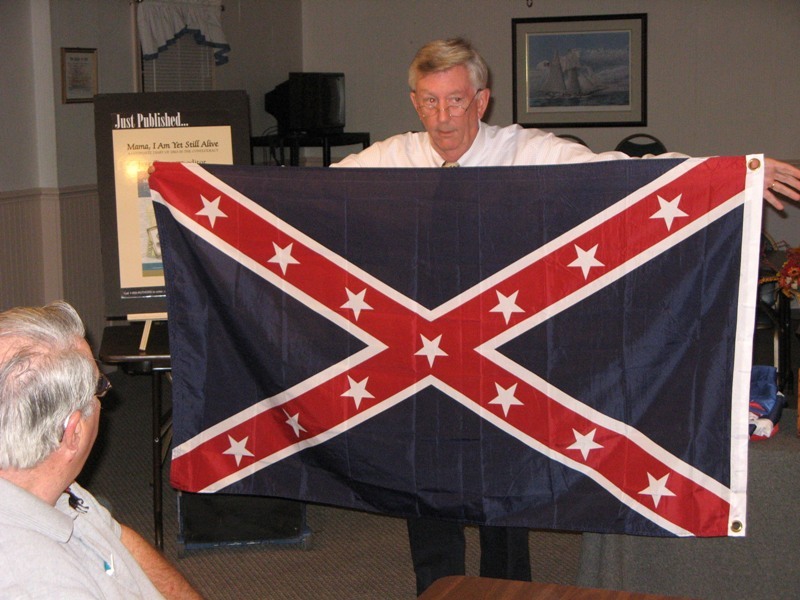 This flag is the first of 3 different national flags for the Confederate States of America. I am joined by Armadine Twigg (L) and Nancy Beaton (R) following my talk. Nancy’s great-grandfather (Sgt. Menifee of Co. H – 33rd Virginia Infantry) was mentioned in a selection I chose from a July 3rd letter of Lt. George Buswell. Nancy has no letters from her relative. Further examination of Buswell’s diaries and letters revealed additional mentions of the sergeant and the minor wound he received at Chancellorsville. The sergeant was like a ghost appearing out of the mist. Nancy now had a letter and two diary entries from the previously unpublished ‘voice’ of Lt. George Buswell. 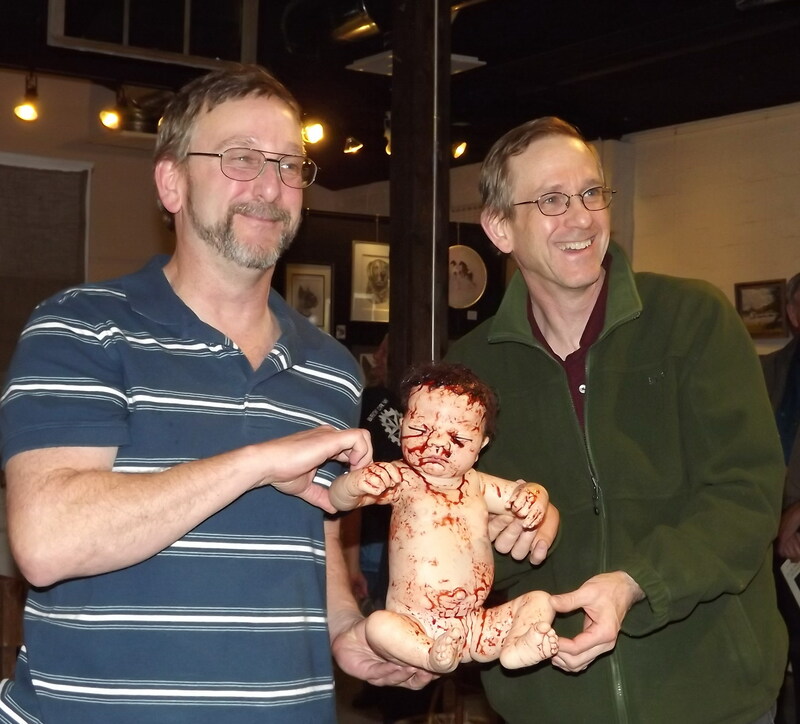 Richard Dupuy Watkins and William Watkins never had a chance to meet their grandfather Asa. Since he was born in the closing scene of the play, William decided that there would never be a better opportunity. 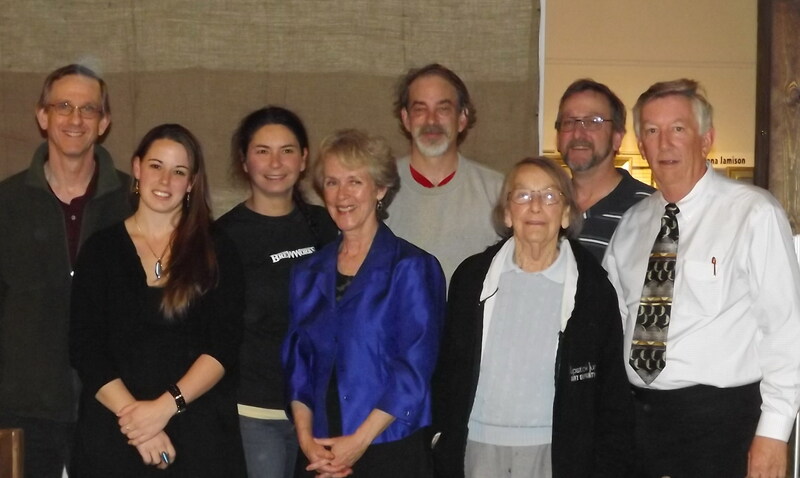 L-R: William Watkins, Allison Antonelli, Cyndi Janzen, Mary Wadkins, Robert Ruffin, Luella Watkins, Richard Watkins and Jeff Toalson. ‘Kiss My Little Girls 1862’ and ‘Kiss My Little Girls 1861’ were both based on the letters in Send Me a Pair of Old Boots & Kiss My Little Girls – The Civil War Letters of Richard & Mary Watkins, 1861-1865. At Bennett Place Historic Site in Durham, NC on September 25, 2010. I am joined by Richard D. Watkins & William Watkins who came to hear me in character telling stories as Richard H. Watkins, their great grandfather. Rock Island National Cemetery, Rock Island, Illinois. The first 1,976 men buried in this cemetery were Confederate prisoners of war. 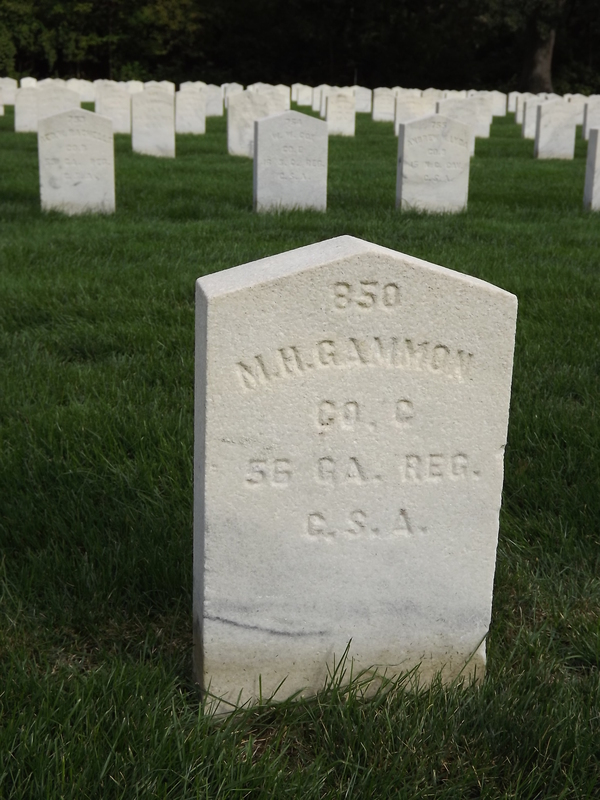 Some 1,850 of these men died of disease and malnutrition as noted on the cemetery website. For insight as to how the others lost their lives you need to read accounts of prisoners in No Soap, No Pay Diarrhea, Dysentery & Desertion. Pvt. Mial H. Gammon – Co. G – 56th. Georgia Infantry was captured at Vicksburg in July, 1863, where he was in the hospital with chronic diarrhea. He was paroled and captured again at Chattanooga in November, 1863. He was sent here and died March 8, 1864 from measles. Over 1,100 men will die here, after Mial’s death, in the last 13 months this prison is in operation. 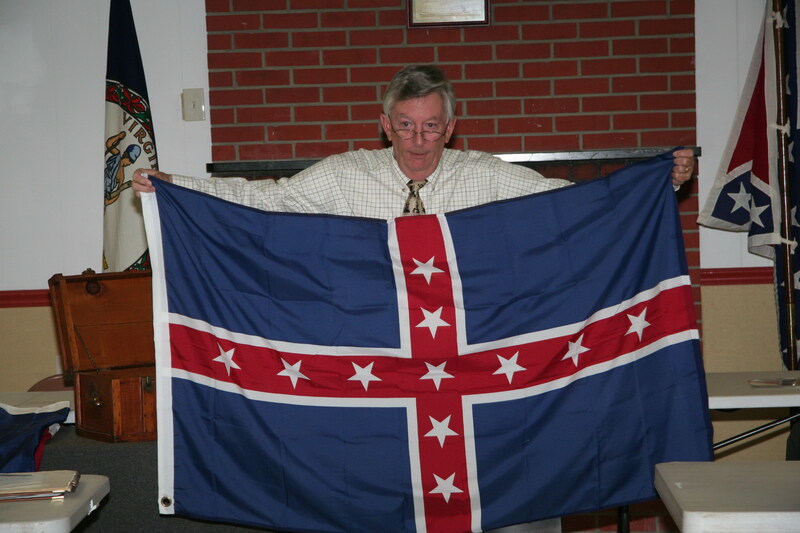 With a ‘Polk’ pattern battle flag during a ‘Mama’ book talk with the Isle of Wight Avengers on March 5, 2013, in Carrollton, Virginia. 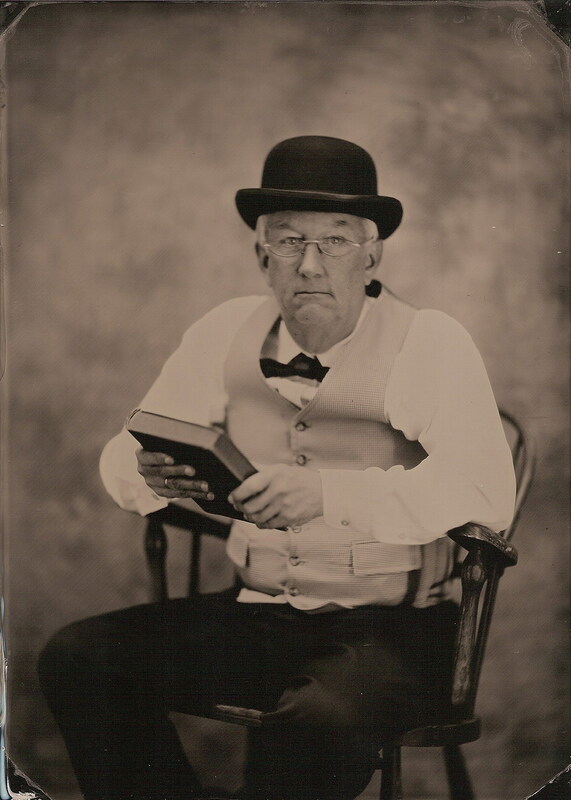 In character as Richard Watkins (1890) doing my ‘Boots & Kisses’ book talk.